Some call it the "Beast of the East." Others have less kind words. Whatever you think of Killington, it keeps "packing them in." Killington handles crowds of skiers very well. 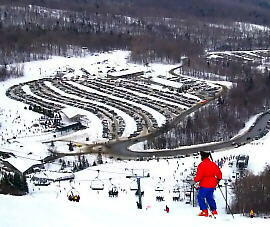 It has super equipment, great snowmaking and terrain that most intermediate skiers can enjoy without too much difficulty. Most of the runs are black diamonds with only a smattering of intermediate blues. The green beginner trails, (one of them is 10 miles long!) serve as main highways or interconnects to the more challenging terrain. It is important to know their names and where they go. But, Killington is vast and impersonal. There is very little about it that says "Vermont." It's more a place unto itself, complete with a garish "strip", "collegiate style bars," and an innovative recycling system for 30,000 gallons of skier sewage. The much touted Grand Hotel looks more like a concrete emplacement left over from the Maginot Line rather than a classy luxury hotel. Skiing here on a holiday weekend is rather like trying to ski through a crowd at Grand Central Station. The risk of collision is high. Hardly a minute goes by without one hearing the scrape of a snowboarder from behind. Still, if you don't like it, you can opt for a less crowded day. Just hand your ticket back in within an hour of your purchase to receive credit for another day. Speaking of tickets. They cost the occasional skier $54.00 including tax and there are stern warnings posted in the Skyeship base area about fraudulent use of a ticket. It can be confiscated if it is not displayed or attached in a prescribed manner. I walked out of the area wondering if I would be detained by a member of Killington's private police force. American Skiing Co. reported a loss of $10.8 million for the three months ending on January 24th. Its shares have declined 80 percent in the past year. American Skiing Co., says it has hired investment banks Donaldson, Lufkin & Jenrette, Inc. and ING Barings to explore alternatives, as its shares have declined. The company may raise equity or undertake "business combinations" to boost financial growth and ensure stability, chairman and chief executive Leslie B. Otten says in a statement. 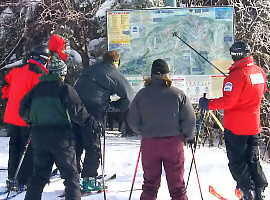 It can take several visits to learn Killington's trails and how to get from one peak to another. It is easy for first time visitors to land up on the wrong trail or on the wrong lift. It's impractical to produce your pocket trail map at every intersection. Still, you can usually find a "ski ambassador" to help out. Dressed in red jackets, these remind British people of Billy Butlin's Red Coats from yesteryear! 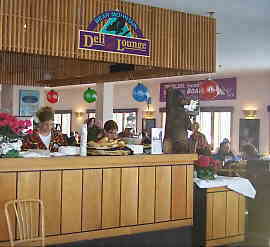 After paying more than six dollars in Stowe for a Turkey sandwich it was a nice surprise to get a portolbello and cooked vegetable sandwich on freshly baked bread at the Killington Peak lodge. Cost of this and a large Coke was $7.50. While still expensive, this was one of the nicest mountain lunches I have had so far. If you want something more exotic, and want to be waited upon, try the Bear Mountain Deli. Most of the items run around $7.00 plus Vermont's infamous 9% Meal tax, of course! As at other mountains, you are better off with a package. (Occasional skiers pay dearly to ski on a weekend!) The lowest cost package seems to be a seven day ticket called the Magnificent Seven for $314.65. You can then ski at any American Skiing Company Resort for $44.95 per day. While lift lines can be a problem, it is the crowded trails on a holiday weekend that bothered me the most. Skiing in high traffic is not fun. Avoid Killington on a holiday if you can. The Skyeship Base Station on Rte 4 is the best place to park the car and ride the much vaunted Skyeship heated gondola (remember the Wagnerian-like radio commercials?). This base area never seems to be crowded. Just be sure that you head down the right trails at the end of the day to get back to your car! Finally, don't rush out and buy the ASC stock despite the recent piece of "hucksterism" on Wall Street by ASC chief Les Otten. Would you buy a company who's CEO ordered Killington snowmakers to manufacture snow at a cost of thousands of dollars for transportation and blowing around Wall Street? The spectacle was held to launch ASC's initial public offering (IPO) and boost its price. Now, there is concern that this spectacle and another one involving the Grand Hotel, has left Killington with insufficient money to lay down a deep enough base so that snow will stay on the major trails as long as it normally does. Discuss this review. Most people have an opinion about a subject like this. Why not join in and perhaps provide some additional information that was overlooked in this review.